just a few photos from our quick trip to LA! we had so much fun and i can't wait to get a few more photos up of all the fun things we got to do! if you are following my instagram (@robynstew8) you got a chance to follow our trip a little closer and may have already seen a few of the photos coming your way, but if not, i will try to have a few up in the next few days! these were a few photos from the view at the griffith observatory which was such a cool view and on such a beautiful day! 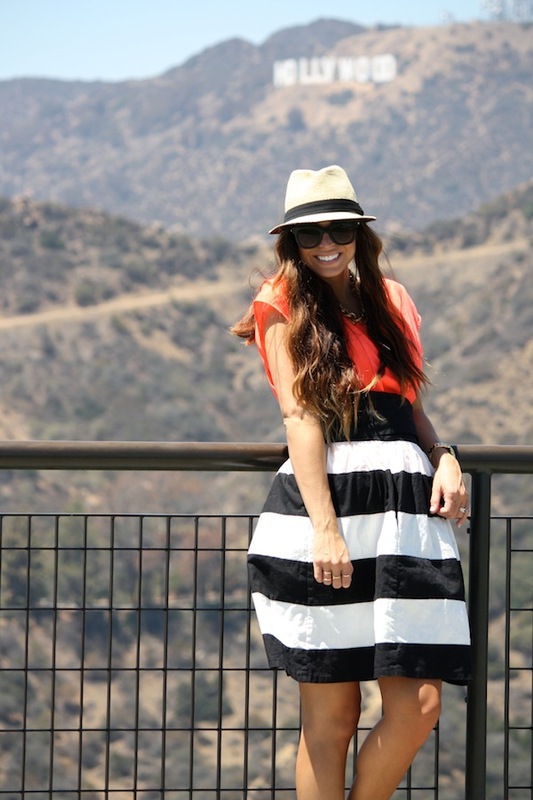 this adorable high waisted skirt was so comfy (especially for this pregnant mama!) and flats were a must with all the walking we did! have a fab thursday and more to come soon! also, don't forget to enter the awesome $200 white plum giveaway here! I think that these pictures are my favorite of yours! That skirt is to die for!! I love the Hollywood sign in the background :) this makes so excited for when I go do my anniversary in October ;) you look so gorgeous in neon. Oh, how fun! Congrats on your anniversary coming up! We had so much fun- are you planning on going to Cali as well? love this look! it is all stunning. You look SO cute! I love the observatory--especially at night (on a not so smoggy day). Glad you enjoyed LA while you were here!! Love the color combination! Gorgeous back drop! i already commented saying i love this look, but just thought i'd tell you i featured it in my "style watch friday" post. hope you don't mind! Aw, thank you so much! I'm so glad you loved it and so flattered to be featured!